The SEC will fine Auburn $5,000 for the team's fans rushing onto the field after the Tigers defeated the Alabama Crimson Tide 34-28 in the Iron Bowl. Football fever can come at price in the Southeastern Conference. The league cracked down on some of college football’s most fervent fans on Friday, announcing that three universities will be cited for their supporters rushing the field after wins, while another school will be disciplined for its fanbase’s excessive usage of cowbells. 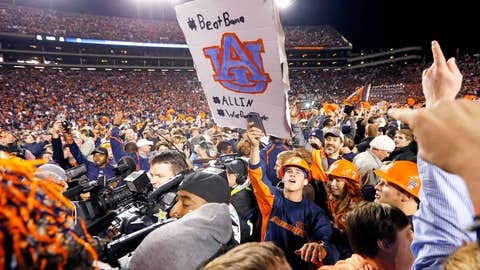 Auburn, Ole Miss and Missouri received fines for fans disobeying a policy that states, "at no time before, during or after a contest shall spectators be permitted to enter the competition area." Auburn and Missouri’s penalties will carry smaller price tags ($5,000) compared to the $25,000 invoice that will be sent to Ole Miss, whose offense is considered secondary following a 2012 fine for a "similar violation." Meanwhile, the SEC will also discipline Mississippi State for spectators infringing upon the conference’s "Artificial Noisemaker Policy." The object in question: Miss State’s beloved cowbell, the one referred to on the school’s website as, "The most unique and certainly the most resounding symbol of Mississippi State University tradition." While the cowbell is permitted at Miss State football games under the league’s constitution and bylaws because it is considered a "traditional institutional noise maker," fans are only supposed to sound them during pregame, timeouts, halftime, after a score, or postgame. Despite a noisemaker-related slogan that requests fans, "Respect the Bell, Ring Responsibly" and a website dedicated to informing fans on the cowbell tradition and ringing etiquette (respectthebell.com), the SEC deemed that the fans got carried away in 2013, and it will cost the school $25,000. "By virtue of the current legislation, the conference has recognized this long-standing tradition at Mississippi State," SEC commissioner Mike Slive said in a written statement on the league’s website. "It should be noted, however, that continued violation of the policy could lead not only to substantially higher financial penalties for the institution, but also to a review of the existing legislation concerning artificial noisemakers."